June 14th Bing broke the news about a new partnership with Yelp. It's no wonder that Bing decided on this partnership as Yelp has long been an industry leader when it comes to online reviews and authoritative local business information. Not to mention that users completely love them. 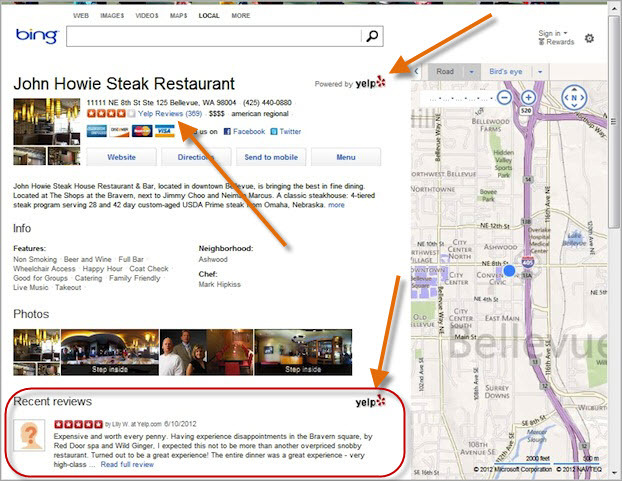 Bing wasted no time integrating Yelp's 27 million reviews and detailed business information such as photos, operating hours and more into Bing Local Results. This move took Bing's local results to a whole new level practically overnight. See the screenshot below to see just some of the changes within the local results at Bing. As you can see in the above example, the new Bing Local Business results are Powered by Yelp clearly, and they aren't shy about announcing it. As of the time of publish, not all businesses at this time have Yelp info showing up. However, we assume the transition will be completed quickly so if you aren't seeing updated results for your business be patient. This is a good deal for both companies, it helps Bing get that much closer to matching Google's highly popular Place Pages (aka Google+ Local) and it gives Yelp increased exposure with a major search engine linking to their reviews. Financial details were not disclosed for the agreement, though the rest of the details are available to read in this Yelp Press Release. Be sure your listing on Yelp.com is accurate!